We are called to share our gifts, time, and talents with each other and service is a beautiful way to do just that! Give Back Sunday, is an opportunity to serve our community by supporting various organizations. Stay tuned for our next collection and thank you for your generosity. Parishioners donated enough items to create 57 Christmas Food Baskets for local families. Thank you also to the Knights of Columbus for organizing, packaging and delivering the baskets. The baskets will be given to Community Christian Service Agency (CCSA). The mission of CCSA, an ecumenical Christian agency, is to provide emergency services to individuals and families in need in San Diego County, including food, clothing, and referrals, and where practical, counseling to assist in their transition to self-reliance. To learn more about CCSA click on their links below. Parishioners donated over 330 pounds (and counting) of Halloween candy, toothbrushes and toothpaste for our friends at Casa de los Pobres (House of the Poor) in Mexico to be distributed at Christmas. 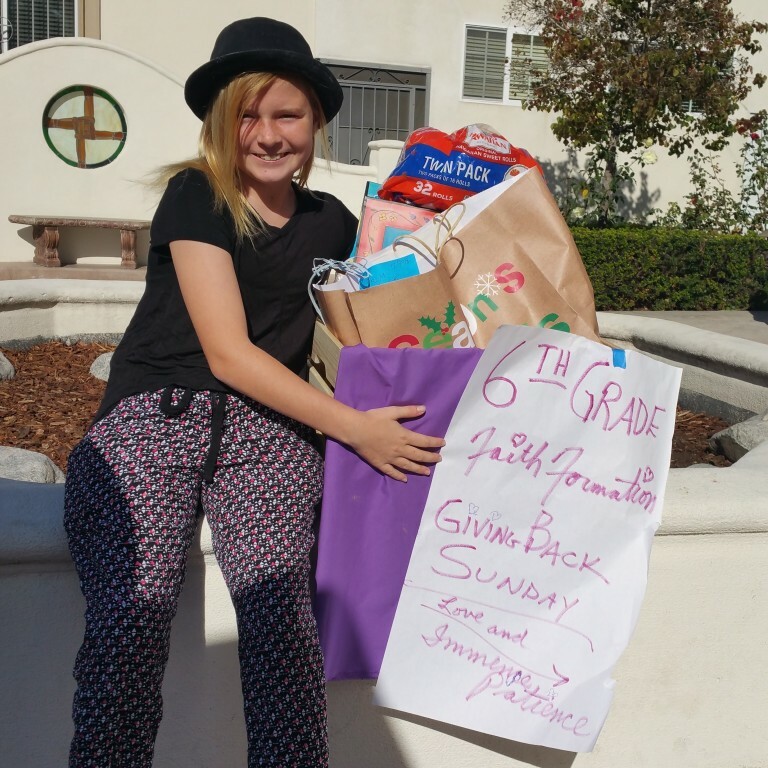 This was then combined with donations from other parishes and Catholic schools around the county and right before Thanksgiving several parishioners sorted and organized these donations to create over 7,000 goodie bags for our friends in Tijuana. To learn more about Casa de los Pobres or to contact Caroline click on the links below. Through your generosity, we donated almost 100 backpacks filled with school supplies. This helped CCSA reach and surpass their goal of donating 300 backpacks this year to local K-12 children through their Back to School Program. Imagine what it would be like if you couldn’t afford school supplies for your child. Through your efforts many local families didn't have to worry about this. To learn more about CCSA click on their links below.